The new 2018 Ducati Panigale V4 is a very significant change of guard at the very top of the Italian brand's product range. The new Ducati Desmosedici Stradale 1100cc V4, and its engineering - both in component, design and intent - is radically different from the Panigale that bows out. But the surprise is that this Ducati - which in 1,000cc form will take on all of the world's superbikes in the, ahem, World Superbikes in 2019 - doesn't get lost in its 214PS (226 with the Akrapovic!) power output. This is a real motorcycle that is accomplished in every single way. 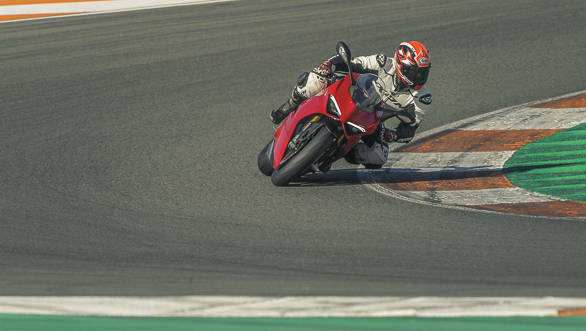 To understand it, let's start towards the end of the lap at the Valencia MotoGP circuit where I spent a day riding the V4 S.
The all-new Ducati is a very small motorcycle. Especially once you're in the saddle. It isn't too cramped despite the 10mm higher footpegs, which is extremely welcome. The sleek lines of the fairing and that neatly done headlight execution is brilliant! I fell in love with Turns 12 and 13 at Valencia. I found the line after a few stabs at it and some help from Giulio Fabbri, Ducati's product communications lead. And in my case it meant slamming the Panigale V4 S on its side into the fast right that is 12. The line here is crucial because the exit doesn't have a lot space and running wide means you have a date with the gravel trap, no options. And moments after you knee goes down, you're already lifting and turning the motorcycle, now going about 120kmph the other way for Turn 13. 13 is properly scary. I was hitting over 180kmph regularly through this and that isn't fast, let's be honest. But you're turning left, knee just off the floor, the speeds are very high and the turn ahead rises and rises without giving you any clue as to where the rest of the turn goes. Flying blind at 200kmph? Oh yes. 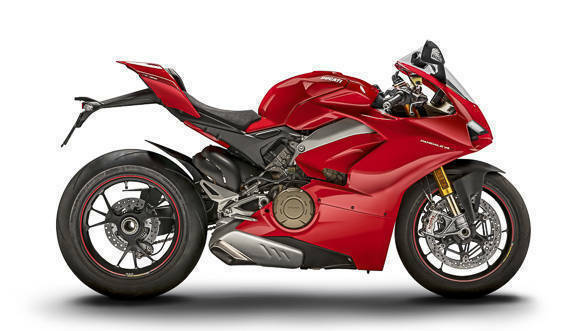 The 2018 Ducati Panigale V4 S's 214PS engine steals a lot of the attention because Ducati moves from its traditional twin-cylinder engines to this V4. But the company has matched the chassis to the engine beautifully and this is the consummate performance flagship. That's where the electronics come in. The turn is also mildly off camber and on multiple occasions, I felt the normally infallible Pirelli Diablo SuperCorsa SC2s slide just a little bit. A racer wouldn't notice it but I did. It makes for a hard knot in the stomach that asserts itself amidst all of those sensations. And then the IMU realises that it needs to intervene and depending on the mode you're in and the level of support you've requested, it sort of solves the issue without any fuss. I'm a hero (thanks electronics!). Or it magnifies the slide and holds you in it securely if that's what you want. I'm a hero (thanks electronics!). The IMU is used in very, very impressive ways by Ducati with the intention of expanding the safety envelope for a new or intermediate sportsbike rider, as well as allowing an advanced rider or racer to rely on these electronics to further enhance the results of their considerable skill. It's a daring approach to be sure and it really does work. The slide control is just one of the things, we were encouraged to try the brake to slide mode as well but I proved to be too chicken to give it a go. But there's no mistaking what an achievement this Ducati represents. Because it remains tiny. And after all the tech and systems you listen to in the PowerPoint, you wonder why it looks so small, to be honest. On of the reasons is that the brand new V4 is the heart of the bike, in engine as well as in frame. 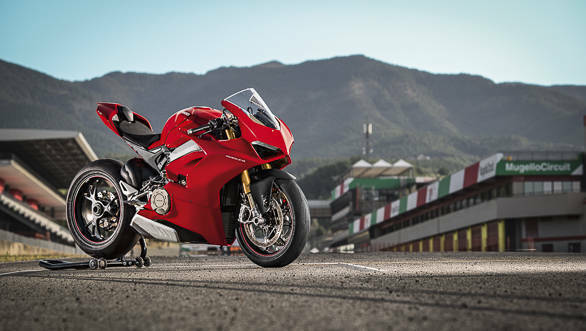 In fact, we have a full separate story on why Ducati chose the configurations and technology it did for their new technology and performance flagship, the Panigale V4. The engine is all-new deriving fluid dynamics for the head from the MotoGP bike - which is why it shares the 81mm bore with the Dovi's Desmosedici. That's the biggest bore in the class right now and Ducati are likely to stroke the engine to get the WSBK bike, most like the V4 R that arrives end-2018. The V4 fires the left side cylinders 90° apart, takes a break and then fires the right side cylinders 90° apart as well. They call his TwinPulse and it makes the V4 feel more or less like a Ducati twin although it sounds bonkers, properly MotoGP V4 bonkers at full chat. Revving to 14,000rpm, the Ducati will hit 214PS at its peak but the engineers are rather proud that 100Nm is breached at 7,000rpm and the engine never looks back. This means you can ride it backed off without fuss while you figure out the serpentine Valencia. I imagine that this would still be a frighteningly hot motorcycle in street use in India and it didn't like the revs dropping close to idle on the slow run back into the pits either. But get past 5,000rpm and it's very smooth and quiet indeed. By 8,000rpm, it's definitely awake and singing. The roar to the redline is strident and strangely unstressed. But all that can (and does) overwhelm you initially. Because eventually, you get used to the power. Sitting up out of the fairing at 270-275kmph to start braking into turn one doesn't get any easier but it does get more familiar. The slick quickshifter becomes second nature, as does the mild non-scary weave when you're in someone's dirty air. The Sachs upside-down forks on the Ducati Panigale V4 are fully adjustable. 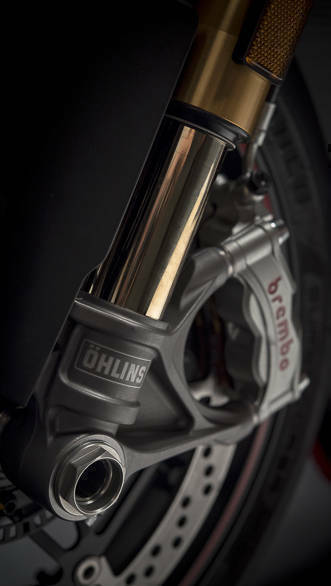 The V4 S gets semi-active Ohlins in their trademark gold shade. Also note the brand-new, lighter Brembo Stylema calipers. They produce insane force with incredible feel. Lovely! Then you notice the brakes. They're phenomenal! 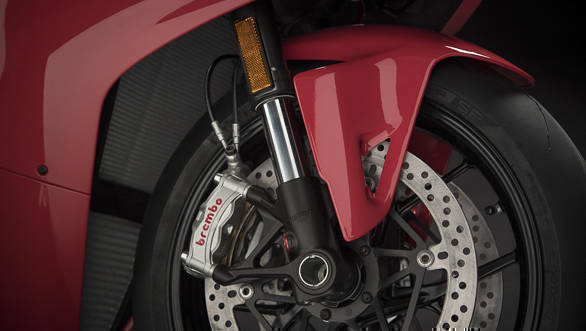 The new Brembo Stylemas are lighter and top the M50 monoblocs. But the way they decelerate the motorcycle is beautiful. There's enormous power but its offered to you with a telepathic correctness that leaves thinking that the bite, progression and feel are all nearly perfect. And then you notice the handling. The SuperCorsa is a legendary tyre and it's brilliant in grip and you can really trust it. But the aluminium Front Frame, lightweight magnesium components, light forged wheels, 60mm(!) longer swingarm, all make an impact. Because the V4 S seems entirely unable to make a misstep. Ducati moved the pegs up 10mm to make more ground clearance and there were still people who thought the bike could lean further. 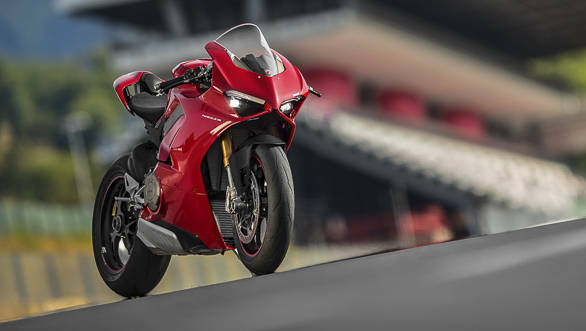 The effortless rapid fire way it changes direction is breathtaking and Ducati says the reverse rotating crankshaft does make a notable difference. The tiny Ducati is grippy and stable mid-corner and you never feel like you're in anything but a happy place. And then when you're ready, you can add a surprising amount of throttle and fire extremely fast exits off without a hitch, allowing the electronics to take up whatever glitches you're introducing as you go. The silent hero here is the suspension. The V4 S gets the Ohlins Smart EC 2.0 system which is semi-active and sensitive to mode selection. But more importantly, you can not choose how you want it to work with you under acceleration, braking and mid-corner, working a numeric scale while the graphics explains whether you're choosing responsiveness or performance over stability. I didn't really fiddle with the systems to be honest but the fact that you can go this fast on a motorcycle this electronic without noticing the suspension at all is a massive, massive compliment to the capability and the tuning of the suspension units. 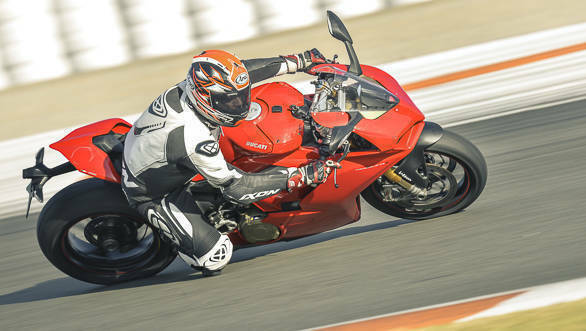 Ducati India has opened bookings for 20 Panigale V4s in India as I write this story. The base V4 - no semi-active suspension - starts at Rs 20.53 lakh ex-showroom. The V4 S is priced at Rs 25.29 lakh ex-showroom, which is a bigger jump in price than I was expecting. 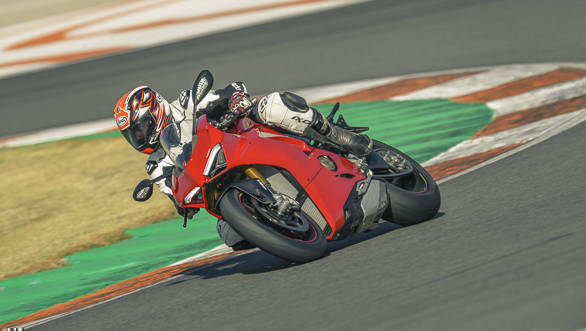 But given how effective the suspension is, I'd pay for the S. Ducati India has 20 Panigale V4s on sale for now with deliveries starting in July. As owners in India, you'd do well to discount any serious street riding in intent or capability - although I would totally ride the V4 everyday in cooler, less dense European or American traffic. 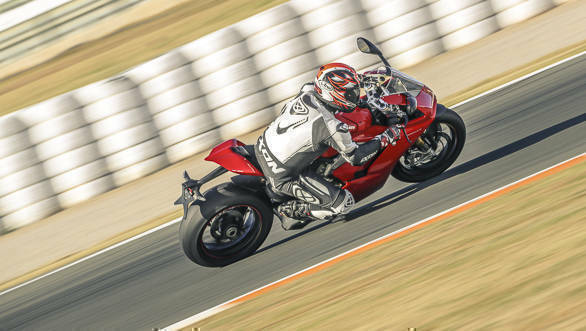 But out on the racetrack the Ducati Panigale V4 will be a huge, happy surprise. This is an incredibly friendly motorcycle for something with this much power. And that underlines what a well-rounded performance motorcycle Ducati has gone and made! All-new Ducati Panigale V4: How it was made? 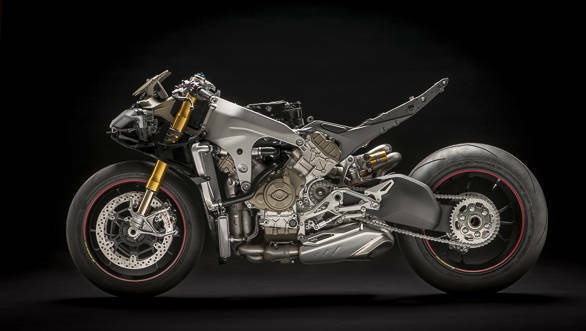 All-new Ducati Panigale V4: What's inside?